Wednesday, May 14, 2003... Greetings from Concord, CA, where I'm spending the first of two consecutive nights freeloading off friends. Today's itinerary: Fresno to Visalia to Sacramento to Altamont Pass to Walnut Creek to Concord. Plot that on a map and it looks sort of like a backwards P. I had all day to get from Fresno to a 7 PM Baseball Prospectus Pizza Feed in Walnut Creek, so I started by doubling back to pick up old 99 where I had stopped before the two-day national parks side trip. This was basically a travel day. I drove north on 99, detouring for anything that looked interesting, with a special eye toward photographing old motel signs. I'm planning to create a "Signs of 99" section on my Web site similar to the Signs of 66 pages. Besides, there's not a whole lot else worth photographing on this drive. The highlight came on the drive north through Fresno, where I stumbled upon an open-air red light district. 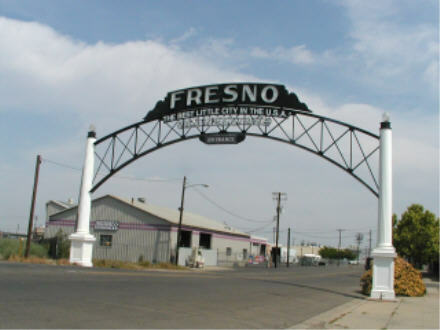 The most attractive hookers wouldn't work in Fresno. The most attractive Fresno hookers wouldn't work the streets. The most attractive Fresno streetwalkers wouldn't be looking for customers at 10:15 AM. You can imagine what the ones I saw looked like. They were standing outside a few motels that probably hadn't had a guest stay the entire night in years. In another part of town, I found the welcome arch above. It spans Van Ness Street, which used to be the main route from the south but now is a half-forgotten path through the industrial district. 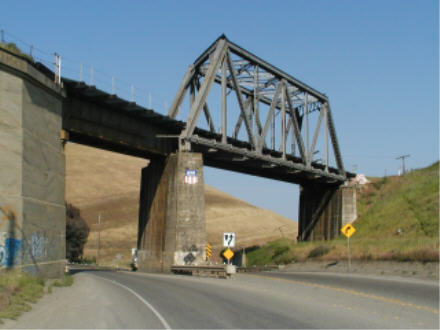 To find old 99 among the bypassed sections, I navigated with the aid of a 1942 Auto Club of Southern California road atlas to Pacific Highways, complete with a "win the war" message on the back cover. Some of the hand-drawn maps of that era are more detailed than their modern equivalents. When I reached downtown Sacramento, I declared the northbound trip on 99 over. I'll pick up from here later in the summer, driving from Sacramento to the Canadian border considerably faster than I've taken to drive from Mexico to Sacramento. Then I turned back south and headed west on the original 1915 alignment of the Lincoln Highway across Altamont Pass, across hills now covered with windmills generating power. I could have followed the Lincoln a little further towards the Bay Area, but opted instead to get to the Pizza Feed a little early.